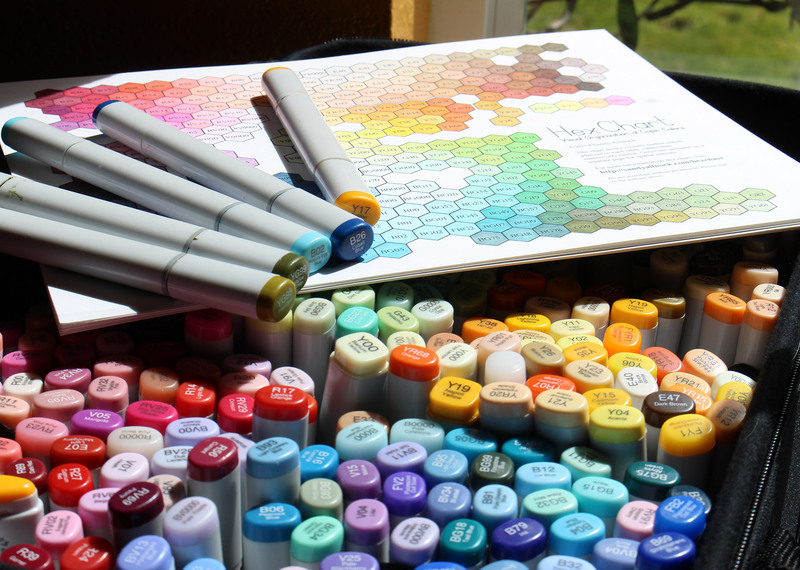 The Copic Hex Chart is an excellent aid to colorists because of the color arrangement in visual order – not numerical. The chart makes marker selections more visually instinctive, allowing the artist to see appropriate and sometimes surprising blending colors a few blocks away on the chart. The colored chart included makes marker purchases easier with the ability to see similar colors to avoid spending on colors that are too near to each other, and helping to fill in gaps in an artist’s collection. Note that the process of scanning and digitizing and printing alters color, but the color chart is still a help. This chart is not required for any class here at Art-Classes, but students may find it a help. It is the same chart that has been sold on the instructor’s blog since 2014, and has not changed since then. If Copic adds colors to the line, a new chart will be issued for free to previous purchasers. This chart was not created, nor is endorsed, by Copic or Imagination International. My go to tool for any copic art! I love copic coloring and I refer to this chart all the time. I started my Copic journey picking random colors that I liked and using the number system – which was not successful for me at all. I ended up with too many markers in almost the same shade which was discouraging and costly. Using Sandy’s Copic Jumpstart, Alternate Colors handout and the Hex Chart I was able to build a good variety of colors that I love using. Sandy again sets her students up for success in a positive and practical way. Thanks Sandy. This chart is a must have for anybody that enjoys Copic markers. The visual layout of colors is a go-to resource for choosing color combinations. The layout helps you to see combinations that you may not have thought about if only looking at standard color/shading group. The fully colored version is also helpful for you to decide what additional markers you may want to add to your collection!